Although India’s rapid strides in space could not have been possible without Russian cooperation, it is not useful to remain nostalgic about the past while ignoring the present. Both countries need to synergize their relations keeping in view the changing dynamics. India’s successful Mars Orbiter Mission brought it on to the world stage as a space power. It is the only country in Asia which has successfully conducted a Mars mission, and the only country in the world which could succeed in such a mission in maiden attempt. The country’s successful development of indigenous technology and its use in space exploration in past few years have really been astounding. This year is also the thirtieth anniversary when the only Indian astronaut, Rakesh Sharma, travelled to Salyut-7 Soviet space station from Baikonur Cosmodrome. The story of India-Russia (Soviet) space cooperation did actually start much earlier. The Soviet Union was the first country not only to send an Indian astronaut to space, but also to launch its satellites like Aryabhatta in 1970s. The collapse of the Soviet Union did impact the bilateral relations including cooperation in space. The cryogenic technology controversy was one such issue. However, the cooperation in the area of space picked up gradually. In 2004, both the countries signed an agreement for peaceful exploration of space and another agreement for development of GLONASS satellite navigation system and launching the Russian spacecraft by Indian rockets. There were also deliberations on joint development of equipment of solar probes, building of space-based solar observatory to study X-ray radiation, and on join research in the area of electric engines for spacecraft. In 2005, an agreement was signed on technology safeguards while implementing the long-term cooperation in the area of joint development, operation and use of the GLONASS system. This agreement envisaged launching of GLONASS satellite using GSLV launch vehicle of India, and in turn Russia providing access to GLONASS system signals for Indian use. It also envisaged joint development of user equipment for exploitation of the signals for commercial purposes. The agreement opened the road for the implementation of a 2004 agreement on joint design and launching of GLONASS communication satellites, which would be used by both countries for civilian and military purposes. An agreement on cooperation in the field of solar physics and solar terrestrial relationships within the framework of Coronas-Photon project was signed in 2005. The project aimed at research in the field of solar physics and solar terrestrial relationships. The agreement also enabled integration of the Indian RT-2 payload with the Coronas-Photon spacecraft and the joint space experiment using the RT-2 equipment. The agreement revived a Soviet-era CORONAS-PHOTON project under which six instruments fabricated at the Tata Institute of Fundamental Research in India were to be installed on a Russian Photon satellite. In 2007, India’s space agency ISRO and Russia’s space agency Roscosmos signed an agreement to jointly develop India’s Chandrayaan-2 mission. The space craft was scheduled to be launched in 2013. 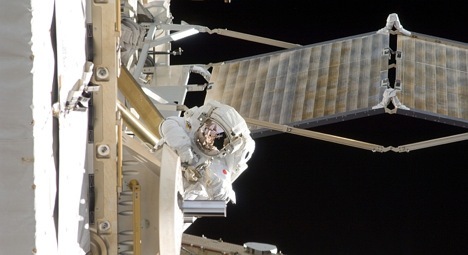 In 2008, both the countries signed a MoU on human spaceflight programme. The lists are in fact long, and that itself is an indication of desire of both the countries to jointly develop space programmes for mutual advantage. In April 2014, the Head of Russia’s space agency Oleg Ostapenko reiterated Russia’s interest to develop space cooperation with India and China. Recently, Russia has announced a slew of space programs worth billions of dollars. India can be attracted to participate in some of these programs. This will strengthen bilateral cooperation, provide India needed space technology, and Russia capital, and strengthen mutual space economy. Besides government to government cooperation, it is also crucial to promote public-private and private-private cooperation in space sector. Already there are examples like Sistema Shyam Teleservices Ltd. Though some problems emerged due to a scam in India, the officials of both the countries handled them deftly. In July this year, India’s company Aniara signed an agreement for design and production of telecommunication satellites with Russian company Dauria Aerospace. The project is worth $210 million. Along with another company, Dauria will implement the project, and be responsible for analysis of the mission, flight, and ground control. The joint cooperation will widen Aniara’s space business by enabling it to enter satellite communications and broadcasting markets in other countries. It is necessary that both public and private partnerships are encouraged. The number of millionaires and billionaires in India are increasing, and the nouveau riche of India can play a key role in boosting bilateral space cooperation. Indian and Russian space agencies, however, need to sort out differences in mutually beneficial way. Differences on projects like Chandrayaan-2 or human spaceflight programme could have been better addressed. Last October, India’s space agency chief expressed dissatisfaction at the slow pace of developments of the project and declared India’s intent to go solo in the project. Perhaps the problems regarding the project could have been better handled had the officials dealing with the project resisted the temptation to go in public to detail the differences, and attempted to sort out them in bilateral forums. It may be possible that the project can be developed jointly and launched by 2016 or 2017, with Russia supplying lander and India building rover and orbiter. India’s space odyssey could not have been possible without Russian (Soviet) cooperation. It is, however, not useful to remain nostalgic about past while ignoring the present. Lessons need to be drawn from the past for mutual advantage, and at the same time both the countries need to synergize their relations keeping in view the changing dynamics. It is in the range of possibility that the forthcoming Moscow Open Innovation Forum in October will witness some positive developments in bilateral space cooperation.